The workshop addressed the topic of failure in game development. Jörg Frohnmayer gave a short introduction into the game development software unity 3D and supported the students with their own game prototypes. This post will be updated with web versions of some games so stay tuned! 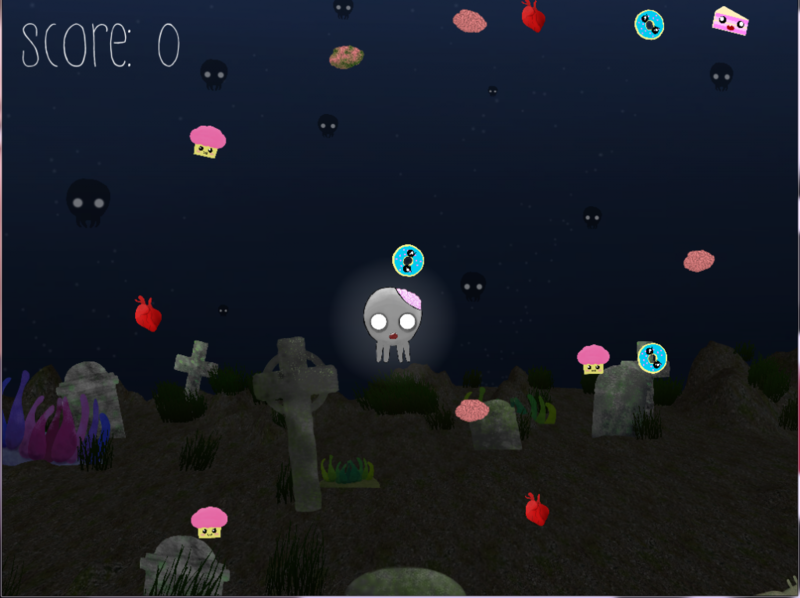 In our mini game you're playing a zombiefied cuttlefish who is very hungry. His favorite foods are brains and human hearts. 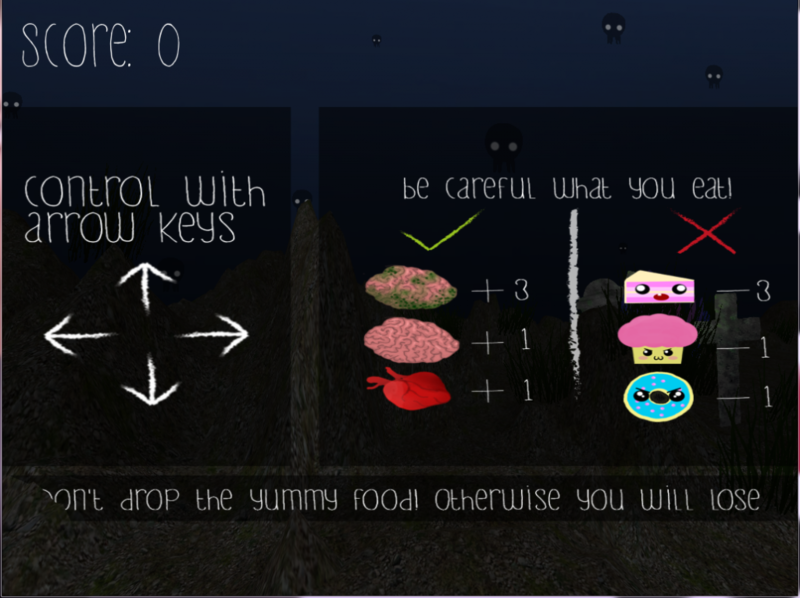 You're the one to help him collect all of the good zombie-food. But be careful, down the ocean there's no "three seconds rule". If you drop his food too often the cuttlefish will die. P.S: Be aware of the drop dead gorgeous sweets, they may be good for you but not for the zombies. The adventures of Bärli: by Bernard Höschele Modic, Julius Reinhardt and Benedikt Hilscher - "The adventures of Bärli" is a cute jump 'n' run game for young and old. Bärli has to find his way through the mystic forest, to get to his mum. On the way through the forest lurk some dangers, Bärli has to escape from. The player has to move through the world, and collect honey-pots to get points. If Bärli touchs a Bee he will be placed back to the start. The level is complete, as soon as Bärli reaches his mum. The nice music and the cute sounds put the player into a wonderful magical world. Dragon Search (Unity Projecct) from Constanze löwenkamp on Vimeo. During the one week long project I build a 3D minigame in the first person perspective. To me it was sad, that it is always the princess you need to search in games, so I turned it around. You search for your dragon. Constanze Löwenkamps game is about a young Dragon Rider, whose dragon ran away. He knows pretty well where he is - on his favourite hiding place in a different world. To get there he hast to find four magic stones, that lie scattered on his island. Also he needs to find the key, so he can open the gate once he summoned it. Hopefully he will find his dragon on the other side. Rocky Rallye: by Sabrina Montimurro - Rocky Rallye is a car racing game set in a stony mountain landscape. To win the game, the driver must not touch the rocks and needs to stay on track carefully. If the car can make its way through the narrow mountain passes for four whole laps, you win the game. Candy Forest: by Costantina Di Leo, Hatun Colak, Jasmin Konyar and Magdalena Nytko - Candy Forest is a game where you can discover a beautiful 3D world. For one collected candy, your getting one score-point. You have only one minute to cross the whole game and collect the candy.